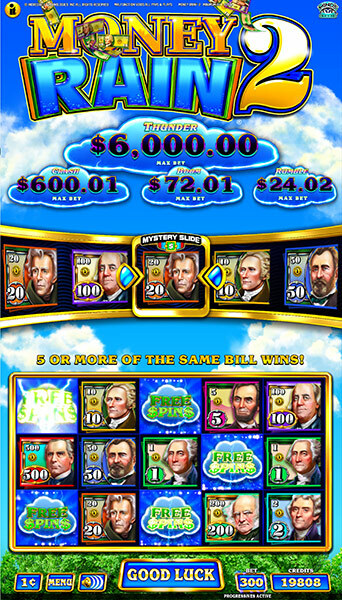 Looks like it’s cloudy with a chance of rain – Money Rain®, that is! 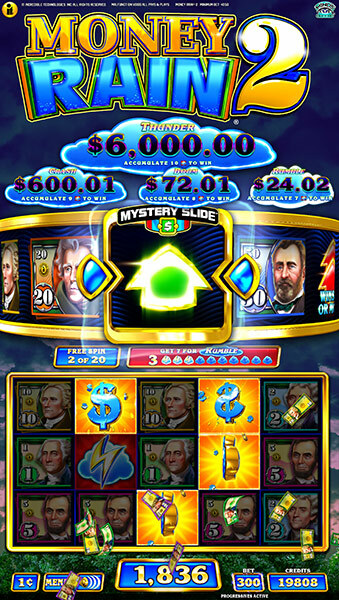 The much-anticipated sequel to Incredible Technologies’ original Money Rain is here! 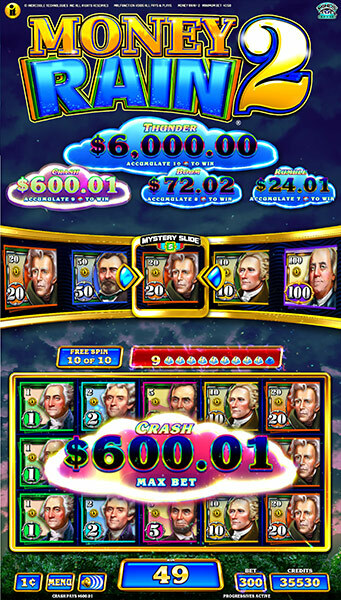 Money Rain® 2 brings player-adored elements of the original game to the stunning new Infinity® V55™ cabinet. Players will recognize the iconic flipping dollar bill symbols and the Mystery Slide™ symbol-transforming feature. Scatter Ways® make wins easy to understand as players know exactly what to look for – 5 or more of a matching symbol! The Mystery Slide is activated when one or more reveal symbols appear on the reels. The Mystery Slide spins to determine which symbol will replace the reveal symbols on the main reel set. 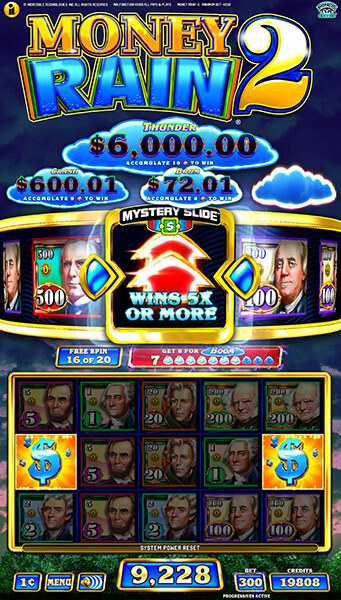 Money Rain 2 brings an exciting twist to this classic feature as single and double arrow symbols in the Mystery Slide prompts the reels to grow from the standard 5x3 to an expanded 5x5 or 5x7 reel set for even more opportunities to win! Three or more scatters trigger up to 20 free spins! 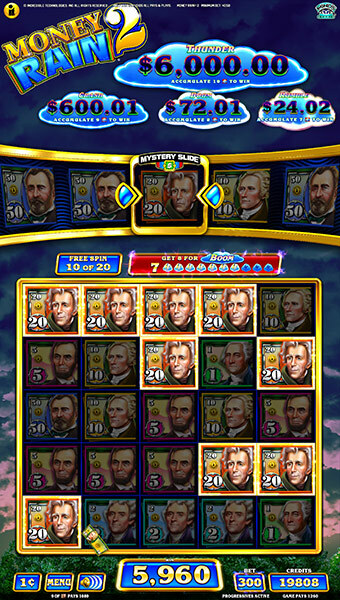 Big wins are an electrifying event during free spins and the Mystery Slide feature with possible reel expansion is still active, but players will really be watching for lightning bolt symbols, as these accumulate for progressive awards! 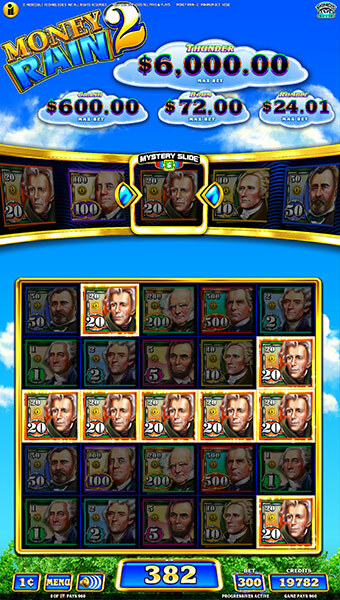 Rumble, Boom, Crash and Thunder progressives are displayed above the reels and shake and rumble when they’re won! Big wins are celebrated with a shower of money falling from the top of the 55” 4K screen, making wins a sight to see for players and spectators alike!